Wine at BottleRock. Photo courtesy BottleRock. 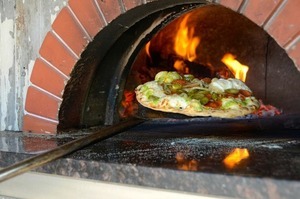 Pizza in the oven at BottleRock. Photo courtesy BottleRock. Food is the new star of music festivals, and this year’s BottleRock Napa Valley is no exception. From Michelin-starred toques including Masaharu Morimoto, Michael Mina, and Top Chef star Michael Voltaggio to “culinary mash-up moments” with celebs Snoop Dogg, Vernon Davis of the 49ers, and Wavy Gravy, food groupies have plenty to salivate about at the three-day music festival May 29th through 31st in downtown Napa. In fact, organizers have added a fifth stage to showcase food and wine: The Williams-Sonoma Culinary Stage. The new culinary stage will be hosted by “Foodie Chap” Liam Mayclem of KCBS. There’s also the food-truck lineup (Bacon Bacon, Curry Up Now, Kara’s Cupcakes), the gourmet food court (Morimoto to La Toque), and wineries (Silver Oak Cellars, Del Dotto Vineyards, Schramsberg Vineyards) that only Wine Country could roll out. If you’re a high roller, VIP sections will offer cult wines and upscale Napa Valley restaurants like Redd, Goose & Gander, and Atlas Social. Platinum VIP tickets will run you between $1,250 and $3,000 versus the general admission cost of $119 per day. Don’t stress if platinum isn’t your jam. However you roll through the festival, you’ll be eating like a rock star. Trust us. 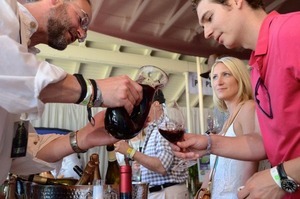 Here are even more delicious details about the culinary lineup from the BottleRock organizers. The (at least for now) full lineup of chefs slated to participate also include both Bay Area and national names including Iron Chef Marc Forgione, Larry Forgione of the Culinary Institute of America, Mei Lin of Top Chef, 11-time World Pizza Champion Tony Gemignani, Bryan Forgione of Buddy V’s, Rick Moonen of RM Seafood, Oenotri’s Tyler Rodde, and Dario De Conti of Ca’ Momi. There will also be Michelin-star chefs Brandon Sharp of Solbar, Ken Frank of La Toque, and Robert Curry of Auberge du Soleil, and the Williams-Sonoma Chef Collective featuring Sarah Simmons of Birds & Bubbles, Matt Jennings of Townsman, the Bon Vivants of Trick Dog, and Jason French of Ned Ludd. Expanded food truck and culinary offerings throughout the festival include Morimoto Sticky Ribs, wood-fired pizzas, pork belly sandwiches, Vietnamese shrimp rolls, barbecue, fried chicken, vegetarian, vegan, and more. Culinary hot spots to be showcased include The Thomas at Fagiani’s, La Condesa, Tarla Grill, Taqueria Rosita, Eiko’s, Fume Bistro, Il Posto Trattoria, Eight Noodle Shop, Ristorante Allegria, The Q Restaurant and Bar, Bui Bistro, Napa Palisades Saloon, Smoke Open Fire, Jax White Mule Diner. Wine and beer will be from Miner Family Wines, Robert Mondavi Winery, Rombauer Vineyards, Clos Du Val, Gia by Gia Coppola, Goosecross Cellars, Round Pond Estate, Aviary Vineyards, Hill Family Estate, Jamieson Ranch Vineyards, JaM Cellars, and JW Thomas Group. Oh yeah, and there are about 70 bands and performers who’ll entertain you while you stuff your face. You know, if you’re into that. Like Imagine Dragons, No Doubt, Robert Plant (!! ), Passion Pit, Cage the Elephant, Gipsy Kings, Capital Cities, Awolnation, Michael Franti & Spearhead, Portugal. The Man, Public Enemy, and more.